Award-nominated Landia GasMix Gets a "High Five"! Pump and mixer manufacturer Landia has been shortlisted for no fewer than five top industry awards by ADBA, the Anaerobic Digestion & Bioresources Association. Landia’s GasMix digester mixing system has been nominated for the ‘Innovation in Sewage Treatment through AD’ award for its performance at the Irish Water site run by EPS Water in Tullamore Ireland. 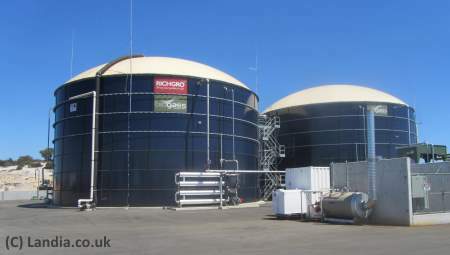 For a major new installation in Western Australia, Richgro (which uses Landia’s GasMix) is among the finalists for Best International Commercial Plant’, with Landia also part of the ‘AD team of the year’ category for the same site. Landia’s GasMix is part of the ‘Best Process Optimisation’ category for boosting gas yields by over 12%. “This is the first time we’ve entered the ADBA Awards, so it’s quite a feat to get shortlisted for all five that we put forward,” said Hugh Vaughan, Director of Landia UK & Eire. “These nominations are a great achievement in themselves”, added Hugh Vaughan. “To win an ADBA award would be really special”. All will be revealed on Wednesday July 6th 2016, during the awards ceremony at Birmingham’s NEC as part of the UK AD & Biogas exhibition and conference.